In our first of these thematic posts, we mentioned how unexpected the Baume & Mercier Clifton Club ‘going bronze’ had been to us. Today’s post is also about an unexpected direction, with MeisterSinger committing to an entirely new collection line. 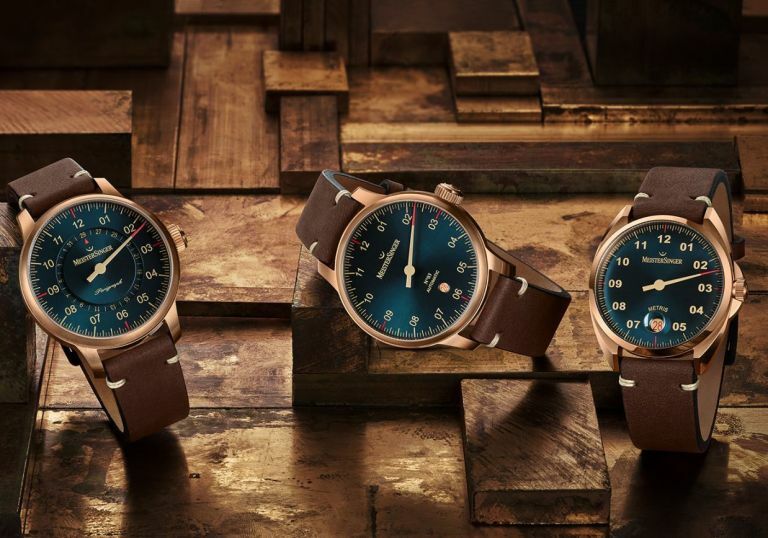 They have chosen three of their most successful current models to turn in bronze for the launch models – the Perigraph, the No.3, and the Metris. The dials are a continuation of the ‘blue dial’ mini trend that we mentioned earlier this year, but in a distinctive almost blue-green colour, with a sunburst finish. The first thing to bear in mind about the new bronze Perigraph is that there was a black-dialled Perigraph Bronze 2018 Edition (limited to 100 pieces) released last year. It turns out that this was not a one-off, but a hint. This new bronze Perigraph uses the same 43mm bronze case with the same water resistance (50m) and the automatic ETA 2824-2 or Sellita 200-1 inside. It comes on a hand-sewn dark brown calf strap with bronze buckle. It is available as of this month and has an RRP of 2,090 EUR (including tax). In all its forms, the No.03 is a MeisterSinger classic. This is in the No.3 43mm case, with a water resistance of 50m, in which resides either an automatic ETA 2824-2 or Sellita 200-1, with a power reserve of thirty-eight hours. It comes on the same dark brown calf strap with bronze buckle. Also available from this month, the RRP is 1,990.00 EUR (including tax). Finally we have the Metris. At 38mm it is considerably smaller and unlike the other two, has a solid case back, with a water resistance of 200m. Movement-wise it is also the automatic ETA 2824-2/ Sellita 200-1, and it also shares the same dark brown calf strap as the other launch Bronze Line models. Its RRP is 1,990 EUR.